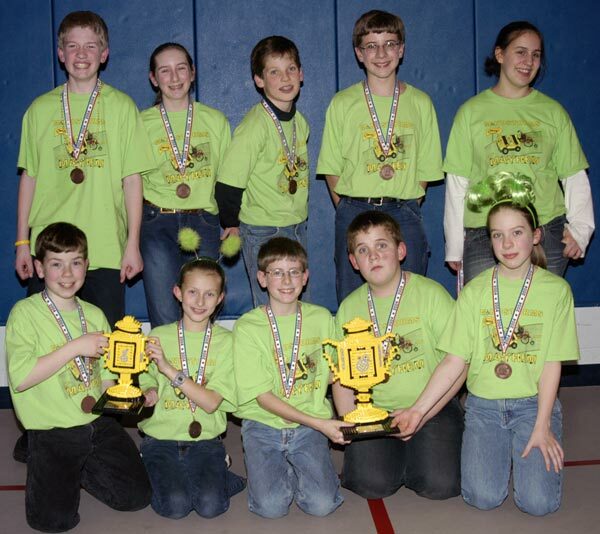 The Mindstorms Mayhem team, front row from left, Ryan Simard, Lyndeborough; Melissa Gray, Milford; Nicholas Hammes, Milford; Dan Umenhofer, Wilton; Amelia Jennings, Merrimack. Back row, David Schunemann, Hollis; Katie Hammes, Milford; Jean Marc Le Doux, Hollis; Nathan Streeter, Bedford; Victoria Umenhofer, Vilton. NASHUA - A team of local home-schooled students took two first place awards in the FIRST LEGO League state tournament Saturday, sending them back to the international competition that they won last spring. Another team - from Milford Christian Academy - came in second to the home-schoolers in the "robot performance" category. The Mindstorms Mayhem home-school team of kids ages 10-14 took the Director's Award, emblematic of top honors across all judging categories, and first place in robot performance. The win means that for the second year in a row, Mindstorms Mayhem will represent New Hampshire in the international competition. It will be held in the spring in the Georgia Dome in Atlanta, site of the Mindstormers' international victory last April. The team includes Katie Hammes, Nicholas Hammes, and Melissa Gray, all of Milford; Victoria Umenhofer and Dan Umenhofer of Wilton; Amelia Jennings of Merrimack; Jean Marc Le Doux and David Schunemann of Hollis; Ryan Simard of Lyndeborough; Nathan Streeter of Bedford. Coaches are Bill Gray of Milford and Ken Streeter of Bedford. Mentors are Christopher Jennings of Merrimack, Nathan Gray of Milford, and Ben Streeter of Bedford. It is one of several teams sponsored by BAE Systems. The theme of this year's competition was "No Limits," and the student-built robots had to complete tasks that a disabled person might encounter. They had to be able to move a CD to a desk, put a ball into a basket, serve a tray of food, feed pets, open a gate, read the correct colored bus sign, push in chairs, bring a pair of glasses back to base and end with the robot on the top of some stairs. There was a time limit of two minutes, 30 seconds. In addition to robot design, each team presented a research project to a panel of judges. Mindstorms Mayhem partnered with the Wadleigh Memorial Library trustees to help make the library more accessible. The team developed and distributed a brochure and instruction sheets for some software programs installed on the library computer that make using the computer easier for people who are visually impaired. At the competition, teams are judged on their robot design, robot performance, research and teamwork. There were three preliminary rounds of competition, followed by the playoffs for the eight top scoring teams. Mindstorms Mayhem placed first in robot performance and earned the prestigious Director's Award for top honors across all judging categories. They are eligible to again represent New Hampshire at the national competition held in conjunction with the U.S. FIRST Robotics Championship in Atlanta next spring. Included in the competition this year was a pilot program for children aged 6-9. Teams had to build a LEGO model of a building, identify inaccessibilities, make a wind-up LEGO car, and assemble what they've learned in a "show-me-sheet." "Mini Mayhem," younger siblings of Mindstorms Mayhem members, formed a team. Robot Performance: 1. Mindstorms Mayhem. 2. MCA Minds-In-Motion, Milford Christian Academy. Innovative Programming: 1. Hampstead Hackers, Atkinson. 2. Batteries Not Included, Hudson. Youth Mentor Award, Steven Bell, Londonderry. Team Spirit: The LEGO Chicks, Manchester. Against All Odds: Spartan Enablers, Nashua. The home-schooled Mini Mayhem team won two awards: "Most Realistic Wind-up Car" and "Best Illustration of the Model on a Show Me Sheet."